With just two exceptions, China has officially halted all of its coal-to-liquids (CTL) projects due to environmental and economic concerns. In a notice posted on its website on September 4, the National Development and Reform Commission (NDRC) said that, apart from two projects operated by the Shenhua Group, none could go ahead before receiving official approval, because CTL is "a technology-, talent- and capital-intensive project at an experimental stage with high business risks". The two Shenhua projects are one it has already launched in the Inner Mongolia Autonomous Region and an indirect coal liquefaction project in Ningxia Hui Autonomous Region jointly invested by Shenhua Group and South Africa's Sasol Limited. Direct CTL is differs from indirect CTL, in that it converts coal directly to liquid fuel, bypassing the process of gasifying coal into syngas. The move aims to "control the business risks of the country's coal-to-oil industry", the NDRC said. The commission also called on local governments not to approve any new coal-to-oil projects. The new restriction presents coal giants such as Yanzhou Mining Group, which already has several CTL projects under construction, with a big challenge, said China Coal Information Institute President Huang Shengchu. Sasol said on Sept 7 it had suspended its indirect coal liquefaction project with Shenhua in Yulin, Shaanxi province. The project had been expected to cost $5-$7 billion and achieve an annual capacity of 3.6 million tons. "The NDRC's notice has darkened prospects for CTL investors in China", Huang said. Rising crude oil prices had sparked huge investor interest in CTL over the past two years. Some local governments and enterprises have already started coal-to-oil projects, including major coal mining groups such as Inner Mongolia-based Yitai Group, Shandong-based Yanzhou and Shanxi-based Lu'an. China is a country with rich coal reserves, which satisfy 70 percent of the country's energy needs. "The main reason China sought to obtain oil from coal was to help ensure energy security," said Shenzhen-based Fortune Securities analyst Zhang Ke. The Shenhua plant that is already operational is expected to convert 3.5 million tons of coal into 1 million tons of oil products annually. That's the equivalent of about 20,000 barrels a day, while China's daily oil consumption in China is around 7.2 million barrels. 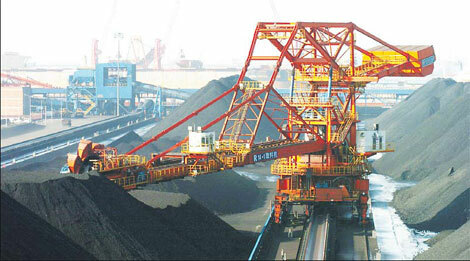 Inner Mongolia had been planning to turn half of its annual coal output into CTL and other chemicals by 2010, requiring around 135 million tons of coal. However, CTL "is not suitable to be developed on a large-scale basis due to environmental concerns", said Zhang. Environmentalists are concerned about the huge amounts of water required by the process and its large carbon dioxide emissions. Every three to five tons of coal can be converted into one ton of oil products such as diesel for cars, while in the process about 10 tons of water is needed to produce every ton of oil products, according to a report by Bohai Securities. Many regions with large coal reserves have long-term drought problems, meaning that CTL projects would put great pressure on the local environment. In addition, this lack of water would also limit the long-term development of the CTL industry. Though CTL technology was developed about 100 years ago, it has been only used by Germany and South Africa when those two countries had difficulties obtaining oil.